Merlin Gill, left, and anthropologist John Sorrillo. Moved by what he saw as a genuine love for the national instrument by a people who could only admire the steelpan from afar, Merlin Gill has donated two tenor steel pans to a group in Cuba. The generosity continues as Gill further gave a commitment to make and donate two seven-piece ensembles. 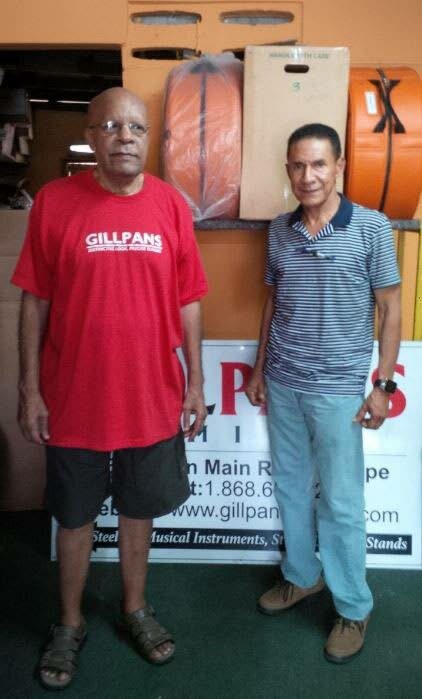 The pan pioneer, fondly called Mutt, is the owner of the popular Gill Pans Ltd of Eastern Main Road in Curepe. He is also the owner of Sforzata Steel Orchestra. “Cuba is right there, and I think that it is time that the pans spread. I will give them, in the first set, two tenors, two pairs of double seconds, two pairs of double guitar and one six bass. I will give them those seven pieces before July, so they will be able to play in the festival,” Gill said in reference to Cuba’s annual Fiesta del Fuego (Fire Festival). The festival is hosted by a group called La Casa del Caribe (Caribbean House) and takes place yearly from July 3 to 9 in Santiago de Cuba. It pays tribute to the Caribbean and Latin America. And if the instruments are not enough, Gill pledges to send a tuner to the Spanish-speaking island. He is also hoping that the infectious music can be spread across Cuba. “After a while playing the pans, they would need blending. If the players play too hard, they could untune the pan and knock out the notes. So, the Cubans would need to blend the instruments at some point. I will organise for a tuner to go up for free and do it. He would blend all the pans. That is how Switzerland does it,” Gill said. A tuner produces accurate pitch and tonal quality for the instrument. The person conducts quality checks to ensure tonal quality. Last month, Gill read an article in the Newsday in which an anthropologist called on the public to donate a pan to members of a steelpan band in a community called El Cobre in Santiago de Cuba. He contacted Newsday saying he knows what it feels like to have a passion for the instrument. He did not hesitate to give the instruments which have the four voices namely soprano, alto, tenor and bass. “I am in pan since I was seven years. I know what pan has done for me. It has carried me all over the world. I feel it for them and I know Cubans are talented people. It is costing me, but I don’t mind. With these pans, they can play any type of music. They have the four voices,” Gill said. Reply to "Sforzata owner sends pans to Cuba"